Labor market at turning point as wage growth hits recovery high. Meaningful wage growth has been a missing ingredient in the expansion for the past eight years. Yet now, with unemployment holding steady at 4.1 percent, employers are finally feeling the pressure to increase wage hikes to attract and maintain their human capital. Further evidence of tight labor conditions can be found in job openings at or near record levels of 6 million positions over the past 12 months. Retail Properties of America has paid $88 million for a Naperville retail and office complex in downtown Naperville, where it plans to build on. The Oak Brook-based real estate investment trust today announced the deal for the 182,000-square-foot Main Street Promenade. The west suburban center, on the east side of Main Street, is 93 percent leased and is zoned for another phase of construction, RPAI said. “The acquisition of Main Street Promenade includes a vacant parcel that has approval for up to 62,000 square feet of mixed-use space, which will provide us the opportunity to leverage our robust, local operating platform and knowledge to densify the property,” RPAI senior vice president Matthew Beverly said in the statement announcing the acquisition. Retail tenants include Anthropologie, J Crew, Ann Taylor and Hugo's Frog Bar & Fish House. Main Street Promenade was developed by Dwight and Ruth Yackley, owners of Naperville-based development firm BBM. They developed the property in 2003 and a second phase in 2013. BBM was represented in the sale by Bob Mahoney and Nick Peters of CBRE. The sale was completed on Jan. 13, the Yackleys said. They declined to say how much it cost to develop the first two phases of the Promenade. The property includes about 103,000 square feet of retail and 79,000 square feet of office space. 1203 E. Warrenville Road, site of the new headquarters for Chervon North America. A Chinese maker of power tools plans to bring more than 200 jobs to its new North American headquarters in Naperville over the next three years. Chervon North America, the U.S. arm of Nanjing, China-based Chervon Holdings, confirmed plans to move workers from Michigan and several suburban Chicago locations when it opens a new headquarters in Naperville sometime in the spring. Earlier today, Crain's reported the company was moving its headquarters to the western suburb from Grand Rapids, Mich. At the time, it was unclear how many people would work in the facility at 1203 E. Warrenville Road. Now, the company said it plans to relocate 75 workers from Grand Rapids and the Chicago suburbs of South Barrington and Geneva, spokesman Joe Turoff said in an email. Also moving there will be 37 employees who were added when Chervon completed its acquisition of Mount Prospect-based Robert Bosch Tool's Skil and Skilsaw brands on Jan. 1, Turoff said. The company also plans to hire 25 new workers this year and another 75 over the next three years, Turoff said. Chervon also considered locations in California, Texas, Georgia, North Carolina and Tennessee, Turoff said. The company is not receiving any incentives from the Illinois or Naperville governments, Turoff said. “In the end our decision came down to three key factors: proximity to talent, proximity to current and acquired employees (and) Naperville's pro-business attitude,” Turoff said in the email. The facility will include research and development, industrial design, sales and marketing jobs, he said. Chervon is subleasing the entire 124,000-square-foot building from Swedish manufacturer SKF Group, which signed a 15-year deal to use the building for offices and R&D. But SKF decided not to move in as the building's exterior was completed in 2015, and instead began seeking a company to sublease the building. Reflecting a lack of suitable global alternatives and a proven track record of steady returns generated by US real estate, the latest annual survey of overseas investors by the Association of Foreign Investors in Real Estate (AFIRE) confirmed once again that the United States remains by far the world's most popular destination for foreign real estate capital. An overwhelming 95% of respondents to the AFIRE survey said they planned to increase or maintain their level of U.S. investment, and 66% said their sentiment was unchanged or more optimistic about the prospect for US real estate. However, the survey results also indicate investor caution about U.S. real estate is rising. One-third of those surveyed in fourth-quarter 2016 by the James A. Graaskamp Center for Real Estate at the Wisconsin School of Business said they felt more pessimistic about U.S. property markets, up from 8% in the late-2015 survey. AFIRE CEO James Fetgatter noted that, with the uncertainty over the policies and legislative agenda of a new administration, interest rates on the rise and narrowing spreads between interest and capitalization rates, "it is no surprise that investors have signaled a note of caution." In addition to securing its status as the leading U.S. city for foreign capital for a seventh consecutive year, New York City ranked as the world's top city for foreign capital for the third year in a row. Los Angeles again ranked #2 among U.S. cities for the second straight year, followed by Boston, Seattle and San Francisco. Berlin placed a somewhat surprising second among global cities, followed by London, Los Angeles and San Francisco. Also notable was the falling stature of Washington DC. For the first time since the survey's inception in 1992, Washington, DC dropped out of the top 5 U.S. cities as a preferred global destination for foreign commercial real estate investment, coming in at #6 after ranking #4 in the late 2015 survey. DC alos fell to #15 globally after rising to eighth place in the previous survey. Fetgatter tells CoStar that the continued decline of DC, as well as the continued ascension of Berlin, were both unexpected results in the latest survey. 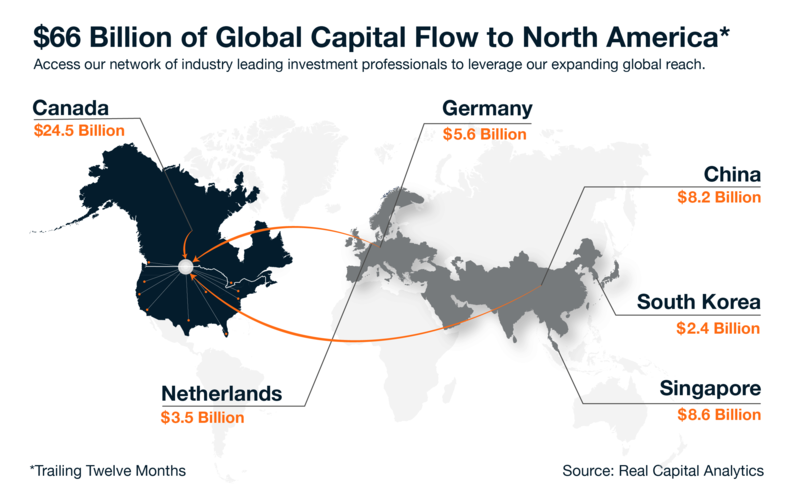 DC ranked as the top destination for global capital among the world's cities several times during the early 2000s, but has not been ranked among the top five global cities in terms of investment attractiveness. It has ranked no higher than #8 since 2013, following an extended period of budget disputes and lower federal spending. Despite the shift in ranking, Catherine Pfeiffenberger, AFIRE chairman and senior vice president of Skanska USA Commercial Development, noted that the District's stable fundamentals will continue to attract capital from around the world, adding that the incoming Trump administration’s expected increased spending on defense and aerospace may also benefit the market's muted leasing activity over the past several years. London, ranked either first or second among global cities for the last five years, took a hit from the Brexit shock, slipping to third place, and fifth overall in terms of its potential for stable and secure real estate returns.